Save more on the items you need every month with Essential Rewards! Also get monthly bonus items and never run out of the things you use the most! Some monthly subscription boxes send a bunch of stuff you never use. With ER, you’ll get the items you actually want! Most boxes come on one date and only one date. Need to postpone ours? No problem. Want to push it through early? You can do that, too! Order things your family actually needs. Cleaners, soaps, supplements, makeup, skincare, and wellness tools—delivered right to your doorstep. Reduced shipping for all ER members. Did we mention the gifts? 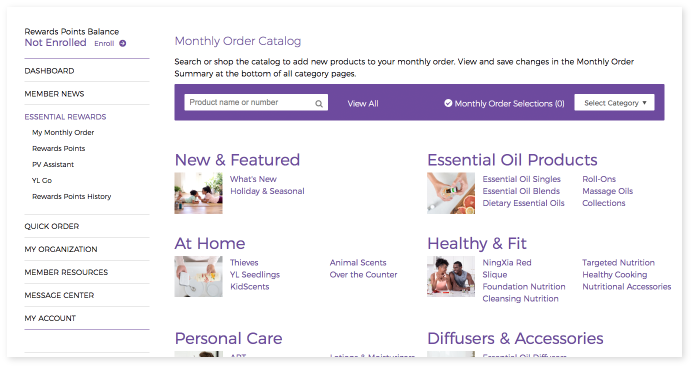 Besides the savings on the items that matter most for your family and inexpensive shipping, Young Living rewards ER members with exclusive gifts and points on all purchases! 10% For months 1-3, you’ll receive 10% back. 20% For months 4-24, you’ll receive 20% back. 25% After 2 years, you’ll receive 25% back on every order! FREE GIFTS EVERY 3 MONTHS! 3 MONTHS After 3 consecutive months, you’ll receive your first bonus gift! 6 MONTHS After 6 consecutive months, you’ll receive your second bonus gift! 9 MONTHS After 9 consecutive months, you’ll receive yet another bonus gift! 12 MONTHS After 12 consecutive months, you’ll get ANOTHER BONUS GIFT! And amazing EXCLUSIVE BONUSES for all ER members every month! So, how do I enroll? Log in to your Young Living Account. And go to Essential Rewards in the menu on the left of your screen. And once on that page, simply click the JOIN NOW button at the bottom. Now you can choose the products you’d like to order. We recommend adding items you need every month, like Ningxia Red or Thieves household products. Not sure what to order? We have a variety of Wellness Boxes for whatever your situation is. Once you’ve selected all your items, you’ll be prompted to Save Monthly Order. 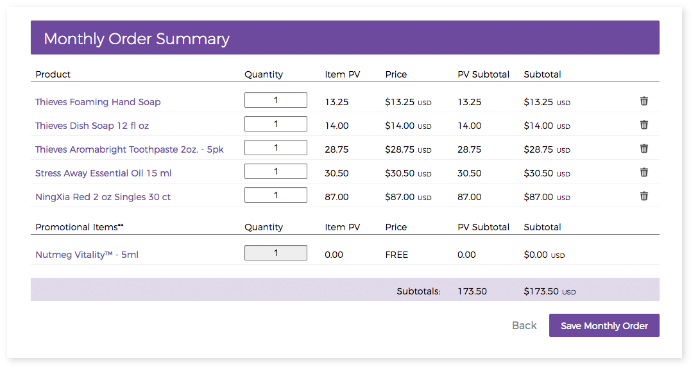 You’ll be able to view everything in your order, adjust quantities AND see all the awesome bonus gifts you get just for ordering a certain amount! Choose how you would like your ER shipped each month. If you have a month where you need things fast, there are multiple shipping options to get your order to you on time. One of the best things about ER is that you can choose when it’s sent to you! 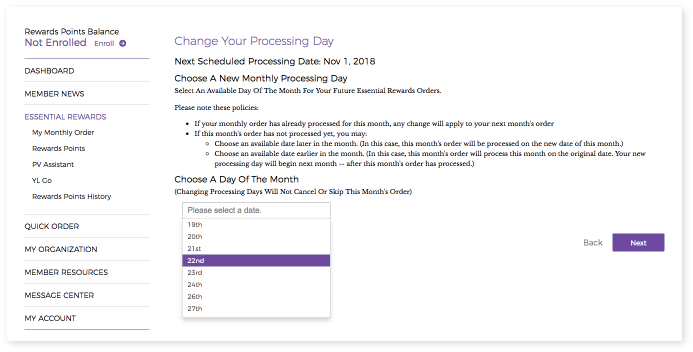 You can stick with your default processing date or find one that works better for you. 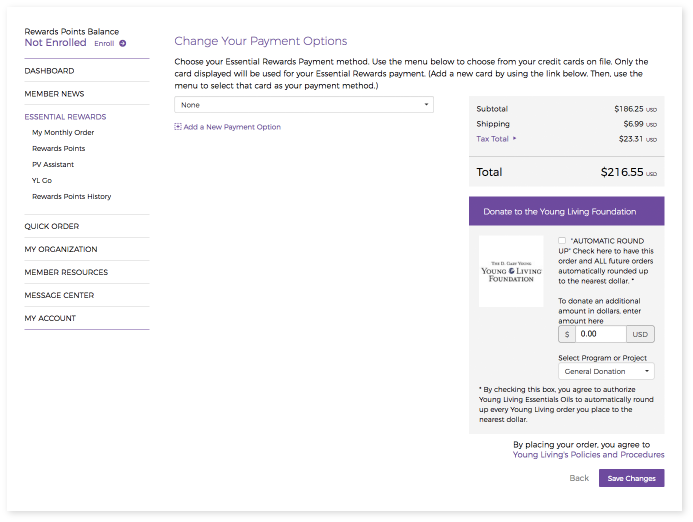 Setup your payment options by entering your card information. 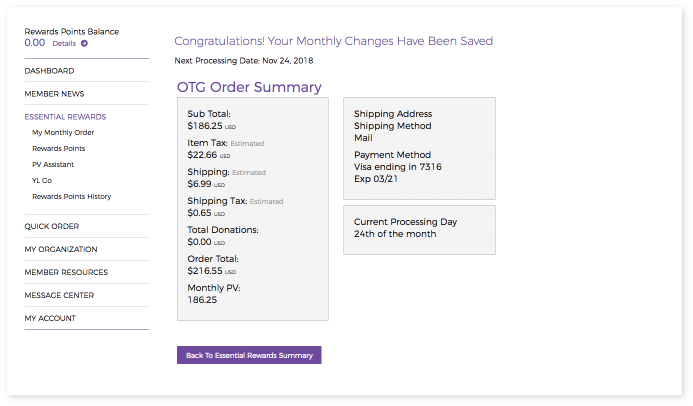 You’ll also have the opportunity to round up your order cost automatically as a donation to the Young Living Foundation. 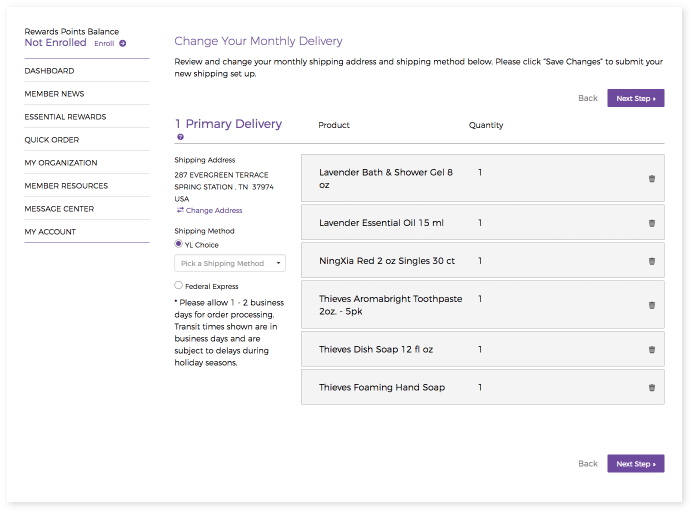 Here’s your order summary that shows the basics of your monthly ER order. You’re good to go! 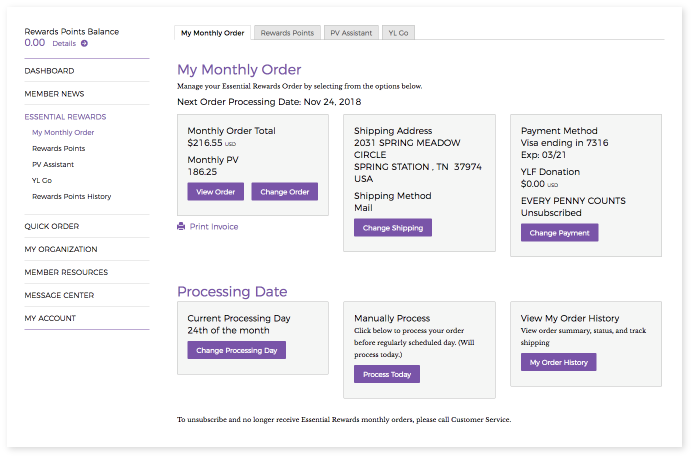 From this page, you can view or change your ER order, change your shipping info, payment info, or processing date, view your order history, and even process your order whenever you’re ready for that month’s order! Don’t miss out on all the good stuff in Essential Rewards! 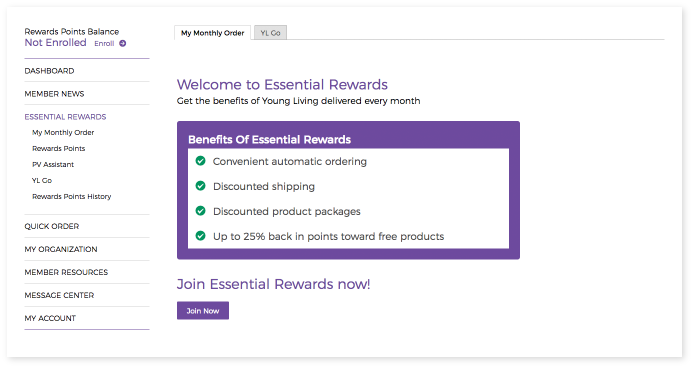 CREATE MY ESSENTIAL REWARDS ORDER NOW Or get more details at YoungLiving.com.